Avenue of the Fountains is the Place to be Thursdays this winter! East end of the Avenue of the Fountains: Hundreds of one of a kind Art pieces, ranging from clothing and jewelry to thoughtful gifts, note cards, and home décor. 11-5 p.m. Thursdays through April, weather permitting. 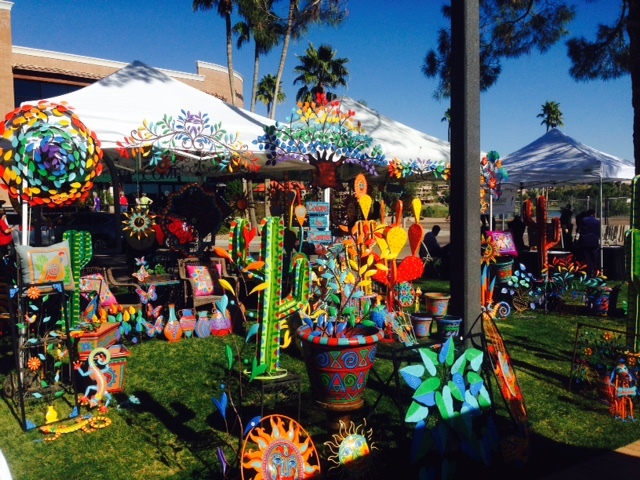 Art on the Avenue is one of the best places in Fountain Hills for visitors and guests. Many opportunities to select clothing and gifts with a southwestern flair, grab breakfast or lunch, and enjoy the majesty of our namesake Fountain. 11-5 p.m. Thursdays through April, weather permitting. Ample parking in the lot behind Sonoran Lifestyle Real Estate as the spots on Avenue of the Fountains fill up fast. This entry was posted in Area Events, Arts, Culture, Schools & Clubs, Businesses We Love, Dining, Libations & All Things Foodie, Uncategorized and tagged Art on the Avenue, Fountain Hills Farmer's Market. Bookmark the permalink.